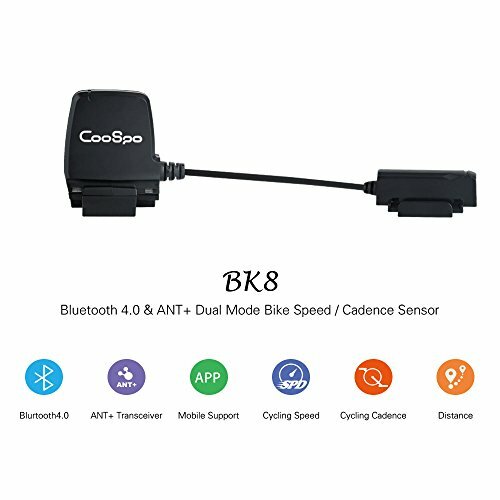 Why You Need A Bike Speed & Cadence Sensor? For cyclists, it's important to master your own cadence, and a stable cadence is the foundation of scientific cycling. Helps cyclists get a better energy output power ratio. Install this bike sensor according to the user manual. Download Apps(WAHOOFITNESS/STRAVA/MAPMYRIDE) and make sure your bluetooth is on. App shows the data only when you're cycling, please make sure the distance from the app and bike sensor is within 10 meters. Track your cycling speed, cadence and distance through wireless transmisson. Save your ride data in real time. Built in ANT+ transceiver, support 50+ Apps, allowing you to train with your favorite App. Waterproof grade IP67, enjoy your cycling every day in all weather. With antiseismic precautions, our bike speed and cadence sensor accompany you on bumpy road. Let you know more about your cycling data, enjoy efficiently exercise. Note: The distance from the sensor to the magnet is within 10mm. You need to pair it with your app instead of pairing it directly with your phone. If you have any questions about this product by CooSpo, contact us by completing and submitting the form below. If you are looking for a specif part number, please include it with your message.